If you have an interest in decentralized storage you would have heard of the likes of Storj, Siacoin, Maidsafe and Filecoin. There are numerous articles comparing various ones to each other which I’ll highlight below but won’t go over. This article focuses on the token supply, circulation and rate of issuance of Storj, Siacoin and Filecoin. Nov 2015: Although a bit dated this link is a great read from Taek, a Sia core developer/founder, writing about Sia v Storj v Maidsafe. What’s also neat is Shawn Wilkinson (super3) the co-founder of Storj joins in and provides constructive counter arguments in favour of Storj. Mar 2016: Taek provides a view of Sia v IPFS here. May 19 2017: Here is a background into Storj providing a useful 1 paragraph comparison to Sia and Maidsafe. May 31 219: A good discussion on Sia v Storj. Can they work together long term? Jul 4 2017: This brief article pitches Sia and Storj head to head. With some background, lets first take a look at the total supply of these tokens. Filecoin has a maximum token supply of 2 billion . 200M of this was open to the “public” or should I say accredited investors. (Individual income over a $200K or assets over $1M). Sia does not have a maximum hard cap like the others. It keeps producing Sia coins forever. Now before you dismiss this concept, let’s take a closer look. Sia has taken the research on board that a cryptocurrency may become unstable if it is to rely solely on fees. Easy reading here, technical paper here. The key is to understand the issuance rate or the “inflation rate”. Filecoins rate of issuance can be seen in the following graph. It has a long term, 6 years vesting for Protocol Labs and the Filecoin Foundation, vesting between 6 months and 3 years for investors, and a mining release half life of 6 years. Siacoin has a 10 min block time (same as bitcoin) producing 144 blocks a day. Each block produces 300,000 Siacoins until the block height reaches 270,000. After that, 30,000 siacoins are created forever. It is thought that the rate of inflation is around 2% per year and that with the implementation of proof of burn where Siacoins are destroyed in order to access some services, the inflation rate will be lower than 2% and possibly deflationary. 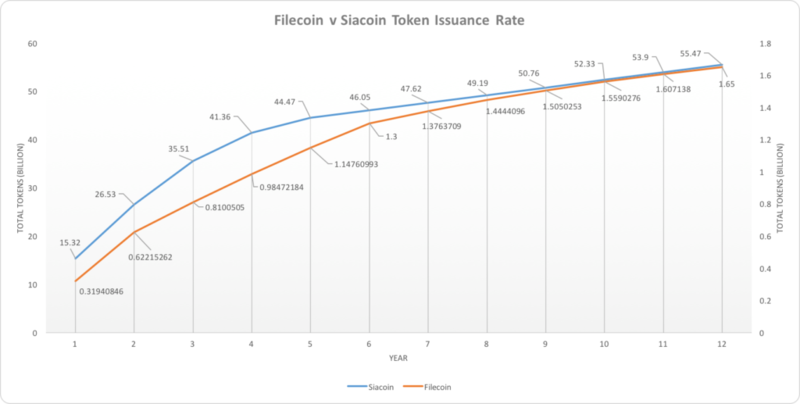 The chart below shows a comparison of the issuance rate of Filecoin v Siacoin over a 12 year period. 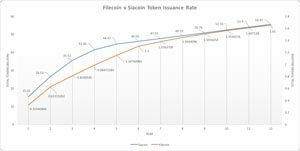 Siacoin’s rate of issuance is initially higher than Filecoin before both tapering off. Six years is significantly better for the Filecoin Network because it disperses a much larger amount of tokens in years 3 – 9 than the alternative schedule. We think this is important to both sustain network growth during that critical period, and to reward long term investment in the network. For Storj, there doesn’t seem to be any data around the Storj issuance rate other than the vesting period which ranges from 1 month to 6 months. Note the 1 month vesting period has lapsed. 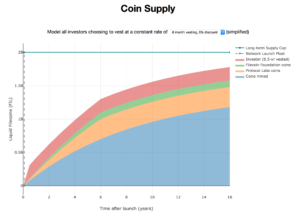 Siacoin’s funding model is also different. Although they have received venture capital to the tune of $1.25M to date they also have a separately traded cryptocurrency called Siafund. Siafund is limited to 10,000 units which are all in existence already. The way it works is that the siafund is the recipient of 3.9% of all successful storage contract payouts using Sia. The token supply and issuance rates for these 3 ICOs couldn’t be more different. Filecoin and Storj have fixed tokens amount, 2 billion and 425 million respectively and Siacoin is unlimited. Filecoin has vesting periods of up to 6 years which is quite long indicating commitment to the project. Storj decreased it’s supply to sweeten it’s appeal but it’s issuance rate is not clear. Siacoin has an interesting issuance model where it provides a lot of tokens in the first 5 years and then a consistent ~2% thereafter.